Complete Sterile Set containing all the necessary for carrying out any type of dental implant surgery operation. It contains everything needed to dress the operator and assistant, surface drapes with adhesive areas for fixing, handpiece sheaths, film sheets for handles and keypads, patient drape with adhesive U-shaped split. The set is wrapped in enveloping absorbent/waterproof drape 145x160 cm. 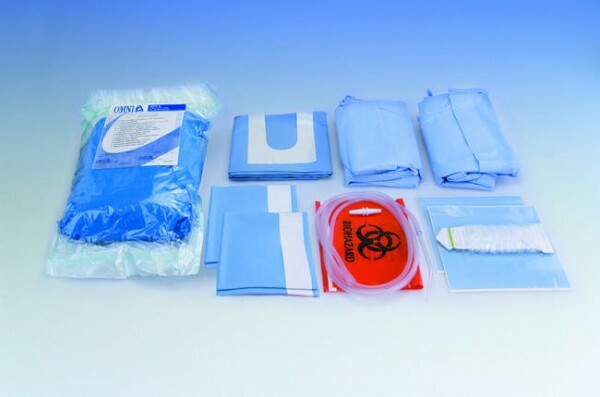 Each set consists of: 2 Special Plus model gowns (size L) with surgical fold and hand towel wrapped in medical grade paper, in light blue SMS Microfibre fabric; 2 Absorbent/Waterproof drapes with adhesive side 75x90 cm, in light blue NWF+Polyethylene; 1 Surgical aspirator with Yankauer cannula, in transparent PVC; 1 Absorbent/Waterproof drape 100x150 cm with adhesive U-shaped split 6.5x30 cm, in light blue NWF+Polyethylene; 1 Omnisleeve sheath 120x7 cm, in transparent PVC; 2 Adhesive film sheets 20x20 cm 2Cross20, in light blue PVC; 1 Bag for contaminated material, in red PVC.